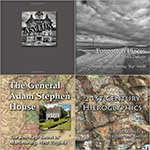 I have four books of photographs currently available on Amazon.com. Click on the cover image below to go to the Amazon page. “Asylum” is a photographic exploration of an extraordinary historical site in the heart of rural West Virginia. The Trans-Allegheny Lunatic Asylum (formerly the Weston State Hospital) is the largest cut stone masonry building in the western hemisphere, second in the world only to the Kremlin in Moscow. Closed and abandoned for many years, the building was closed and abandoned. Now privately owned, it is being preserved and partially restored and is open to the public for tours, ghost hunts, and other events. This book is a selection of images from my “Forgotten Places: North Dakota” project, photographed during two trips to North Dakota 2010. Although intended as primarily an art project, it serves a documentary purpose as well. Much of the history of the Northern Plains is found in the abandoned farms and all-but-abandoned towns, which reflect the evolving economy of the region. This book is a photographic tour of the General Adam Stephen House, the home of the founder of the city of Martinsburg, West Virginia. Built between 1774 and 1789 from locally quarried limestone, the house is an excellent example of colonial stone architecture and is one of the best historic sites in Martinsburg, having been fully restored and beautifully furnished with many period antiques. This book is based on my exhibit, “21st Century Hieroglyphics” at the Contemporary School for the Arts and Gallery in Hagerstown, Maryland in September, 2009. The images were captured in an old quarry in Quincy, Massachusetts. An area that at one time was filled with water has been filled in with earth, probably to prevent people from being injured or killed diving into the quarry water. The result is a grassy space surrounded by rock cliffs that have been liberally decorated with a wide variety of graffitti. I have made two trips to this place and it continues to be fascinating. Looking at these rough granite walls, you are assaulted by a visual cacophony of abstract designs, haunting beings, social commentary that ranges from poignant to sinister to celebratory to simply chaotic. As I walked around the area, I tried to imagine what an archeologist a thousand years from now would think upon the discovery of these strange messages painted on rock walls. Would they know about it that far in the future or would they look at this as evidence of some religious cult or political uprising.